News — Can we ever get enough? Not long ago I was signing up for a trade show online, which then asked me to sign up for different SmartBriefs (www.smartbrief.com). My “first” reaction was – WAIT – I just wanted my trade show badge information. Why am I being asked about SmartBriefs? Soon, I was at a screen asking me to choose “which” SmartBriefs I would like to receive. I still didn’t know what a SmartBrief was and I was already choosing! This was annoying. What happened to my badge signup? Before I knew it, I had signed up for four SmartBriefs (Leadership, Manufacturing, Small Business and Entrepreneurship). Finally, my badge registration was confirmed. I was mentally exhausted! So, what is a SmartBrief? Was it worth signing up? YES, I have found the newsletters to be very interesting; however, on stressful days it does feel like a bombardment in my inbox. On those days, I have been tempted to press “unsubscribe,” but I always STOP myself. Good thing, because today I opened a SmartBrief and read the most amusing story about “Segway Polo” having their first International Championship game in England. That was an enjoyable article! I knew that Segways had been used for tourist sightseeing, but polo? BRILLIANT idea! Segway Polo reminds me of Ultimate Frisbee. It’s those sports that we KNOW are fun, but our first reaction is to not take them seriously, because we think it is recreational – not a “real” sport. So, by taking a moment to read a SmartBrief, a stressful day turned into an amusing one! 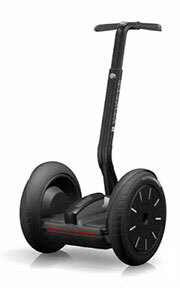 Segway Polo, think about it, this could be fun and definitely easy on the joints. We’d compete Internationally, I’m IN… and you?